And we’re back today with another A Generation Past article featuring the iconic cards of yesteryear! As promised, this time we’ll be looking at the rest of the United Sanctuary clans, Angel Feather, Genesis, and Gold Paladin. Missed out on the previous article? Check it out here! Before we start, let’s have a card reveal for the upcoming release: Cardfight!! Vanguard G Fighters Collection 2015 Winter! Irregulars. Those who choose the path of resistance. 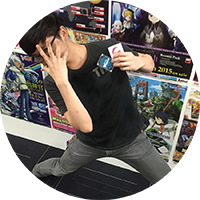 -Stride Step-[Choose one or more cards with the sum of their grades being 3 or greater from your hand, and discard them] this card on your from face down. :When this unit is placed on , if you have a heart card with “Blade Wing” in its card name, return all the cards from your drop zone to your deck, and shuffle your deck. Then, if the number of cards in your soul is fifteen or more, until end of turn, this units gets “【 】All of your rear-guards in the front row get +10000″, and if not, ⑤. How do you think about this card? Let’s return to the topic and kick this off with the Angel Feather clan. Arguably the be-all and end-all for an Angel Feather deck, Battle Cupid, Nociel is one of the most efficient, if not the most efficient, way of activating all your effects that trigger when a card enters the damage zone on your opponent’s turn. Cards such as Chief Nurse, Shamsiel, The Phoenix, Calamity Flame and Million Ray Pegasus rely on Battle Cupid, Nociel’s ability to gain bonus power on your opponent’s turn and reduce the strain on defence. This is, of course, on top of the ability to swap out less useful cards from your hand during your guard step for cards with more shield, or even a Sentinel. Battle Cupid, Nociel is a card that is relevant to this day, as there are many effects that the player can abuse by this effect, such as nullifying an attack on a rear-guard entirely; you can use Battle Cupid, Nociel in a Celestial deck and “combo” it with Emergency Celestial, Danielle. Say your opponent attacks your rear-guard when you have Danielle in the damage zone, and you can’t let the attack hit no matter what. You can call Nociel to the guardian circle and use its effect to swap cards in the damage zone, activating Danielle’s effect. You can then use Danielle’s effect to call itself to a rear-guard circle, even if that circle is occupied. Replace the rear-guard being attacked with Danielle, and as the original target of the attack is lost, the battle ends immediately! Minerva is a card that could stand up against the strongest opponents of its time. That era was dominated by the fearsome Revengers of the Shadow Paladins, but Genesis was given a new tool to fight against them with Minerva. What the Genesis deck of that time lacked was a proper game-ender; while it was arguable that Goddess of Good Luck, Fortuna served in such a capacity, it couldn’t match up to the other powerhouses of the era. With Minerva, this slot was filled, and it also cemented the growth of the Regalia archetype. One of the key strengths of Minerva is the fact that her effect cost is relatively cheap, and it gains additional power after being put to Stand. One support card that really stood out then was Ordain Owl; it was possible to give massive power boosts to Minerva, making guarding its attack a difficult task indeed (outside of a perfect guard, of course). 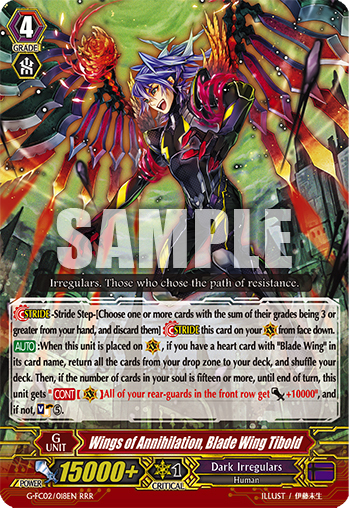 Minerva was also one of the few cross ride cards out there, and a cross break ride at that; having to guard against a cross break ride that can attack twice is certainly nothing to scoff at. Spectral Duke Dragon was the golden boy of the Gold Paladins for a long, long time – and for good reason. Spectral Duke Dragon features another vanguard that can attack twice in a turn, at the cost of its Twin Drive!! and 3 of the player’s rear-guards. This effect alone is not the reason it was the poster boy for Gold Paladin, though. Its nigh-unstoppable deck build usually had very aggressive options in it like Player of the Holy Bow, Viviane, Listener of Truth, Dindrane and Blade Feather Valkyrie – cards that can pressure the opponent and building card advantage. Players also included cards like Gigantech Destroyer for more power, and Great Silver Wolf, Garmore as a back-up vanguard. This coupled with the effect of its ride chain, shot it up to stardom; its ride chain allowed the player to superior call 2 units at the price of 1 rear-guard, allowing for potentially game-changing rushes and beatdowns that put the opponent at 3-4 damage before your opponent even hits grade 3. And another trip down memory lane concludes. That about sums it up for the United Sanctuary clans! Next, we’ll be looking at the ever-popular Dragon Empire clans Kagero and Narukami , so stay tuned!